After checking out, we hopped on the shuttle bus to the airport to get the rental car. Then we stopped by the AAA office to get some maps and driving tips before heading to Denali. We stopped by Wasila to get something to eat. Since we only saw major chain restaurants like McDonald’s and Pizza Hut and didn’t find any place special, we ended up at a local Mexican restaurant, Senor Taco. It was the first time I had chile verde. And it simply became the best Mexican dish I’ve ever had. It was soooo tasty. After about 5 hours of driving, we arrived at Denali Salmon Bake Restaurant and Cabins. I read about this place from some traveler. It is a decent budget accommodation, a rare find in Denali. The private cabin (shack) was adequate with shared bathroom. It was clean and comfortable for the price of a hostel. The next morning, we woke up early for the big day at Denali National Park and ordered packed lunches from the restaurant. And headed to Black Bear Coffee House for some caffeine. The latte was soooo good we had to come back each morning. Welcome to Denali National Park and Preserve! Denali (pronounced de-NA-lee) means the great one. Here’s the shuttle bus which took us all the way to Eielson Center (Mile 66). These shuttles get booked up early. You MUST book them in advance if you want to take a morning ride. The shuttle service is a concession, operated by an independent operator, not by the National Park Service. So feel free to tip the bus driver if she does a good job. Our first viewing of the day. State animal of Alaska – the Moose! 66 miles is a long ride in the park (4+ hours). But with beautiful scenery and wildlife, I didn’t get bored. We were extremely lucky to spot a wolf (though not enough time to take a picture) which is quite rare. There are only about 80 wolves in this vast 600-million-acre Denali Park. And we spotted one! Woohoo! After lunch, we took a guided Tundra walk with a park ranger and learned about the flora and fauna of the sub-arctic tundra. We also learned what to do if we encounter a bear (make noise, etc. and if all else fails, pretend to be dead by lying still on your stomach.) But if you see a moose while hiking, the only option is to run. As fast as you can! On the way back, I thought it would be another 4 hours of long (boring) ride, and everybody would fall asleep. But no, we saw a grizzly bear at close range. Everyone got so excited with the grizzly. We had seen all the Big Five of Denali which are moose, caribou, Dall sheep, wolf and grizzly bear. So mission accomplished. Only one more thing. Mt. McKinley couldn’t be seen due to the clouds. And from the weather forecast, it was going to be cloudy and rainy every single day during our entire vacation. Returning from the park, we headed to Prospectors Pizzeria. Since there is a limited number of restaurants in the area to cater for a large number of tourists, the place is busy. There was a long line, more than half-an-hour wait. So I recommend making a reservation if you can. Of course, being an adventurous/experimental type, I ordered what you can’t normally find in the Lower 48. Pizza with Alaskan reindeer sausage and ground elk! The irony is that it actually looked and tasted just like regular pizza in the Lower 48 with regular sausage and ground beef. It wasn’t bad at all though. As we finished our dinner, the cloud disappeared and the sky became clear. It was my husband’s persistence and determination to see the peak of Mt. McKinley, so he suggested we go back to Denali Viewpoint South at Mile 135 for a small chance to get a glimpse of it. Now it was 9pm, and we were at Mile 237. To go back and forth means a 200-mile drive for a ‘small chance’ to see the peak of Mt. McKinley before the clouds returned and before it got too dark. At 20,156 feet, it is so tall that the peak gets covered in the clouds most of the time. Statistically, only 30% of visitors ever get to see the peak of Mt. McKinley. It was the only chance we had, and we were glad we took it. Just two days after we came back, a tragedy happened. Four Japanese climbers were killed by an avalanche. May the Spirit of Denali guide their souls to eternal peace. BTW, I was struck by two facts from the news. First, this 5-member team was from the Miyagi Workers Alpine Federation. It was just last year in Miyagi Prefecture that the tsunami which was caused by the 9.0 magnitude earthquake had devastated the whole area as we all had seen in the news. Secondly, the average age of this team was 60! The sole survivor is 69! I mean, what would you plan for your summer vacation when you retire at 60? Cruising the Caribbean with your grandkids or climbing Mt. McKinley with your ex-colleagues from work? Tough choice, huh? Anyway, I can now claim the membership of the 30% Club :). 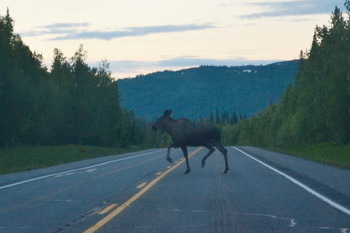 On the way back to our place, we almost hit a moose crossing the highway! I was totally exhausted by the time we arrived at our cabin around 1 A.M. (which was like 5 A.M. for me who still couldn’t adjust to the Alaska time zone.) The next morning we were to drive further north to Fairbanks and meet Santa Claus in the North Pole. P.S. A friend suggested me to write about HAARP in this post since it is also in Alaska. What?!? This is a travel blog, not a conspiracy theory one. (Perhaps in another blog, starting with my favorite subject: Ancient Aliens.) Lol. Anyway in Fairbanks, I did visit University of Alaska, the co-founder of the HAARP program. :) For those who don’t know what HAARP is, google it. You’ll find interesting stuff, including an accusation that HAARP was behind last year’s Japanese earthquake! This entry was posted in Alaska, My Custom Menu and tagged alaska, big five, denali, eielson center, everything under the alaskan sun, moose crossing, mt. mckinley, national park, photography, prospectors pizza, travel, tundra, vacation, wildlife. Yes, Erng, I love them. They are cute, and at the same time look so calm and gracious. Alaska is such a beautiful place! Thanks for sharing these nice photos! Australia is also equally an intriguing place. You’ve captured it beautifully in your blog. Thank you!! I just love photography. :) Thanks for dropping by! Cheers! thanks for sharing your travel diaries!